after several weeks of football immersion, i’ve been thinking that stadiums in south america [and in many other places] are sites in which sports, politics, and music often converged. without the funds for multiple scenarios, cities used stadiums for all sorts of public events. stadiums were the site of important political events, as large spaces ideal to congregate or imprison crowds. as large public arenas they were for large rock concerts. this singularity of site and multiplicity of events [perhaps this is too jargon-y a way to think about it?] is perhaps related to how these events were incorporated into popular music. hence many south americans grew up singing songs related to politics. today, the role of stadiums has shifted and those memories are fading—politicians now operate through media and violence has shifted to more nuanced manipulation. political rallies prefer open spaces without barriers. at the same time, youtube has allowed information to re-emerge and become easily accessible. so while the new generations are growing up without these associations, the previous ones are remembering them. protest songs themselves are too many to list, but these ones in particular pick up on the strange links between football and politics in the continent. on dissappearance: los dinosaurios by charly garcia [in an mtv special, of all places, but it’s hard to get good sound from his older performances]. political event: the ‘68 olimpics were took place in the context of the tlatelolco massacre, 10 days before, in the plaza de las tres culturas. the stadium itself is the site where tommie smith and john carlos protested against racism by performing the black power salute during the medal ceremony for the 200m. 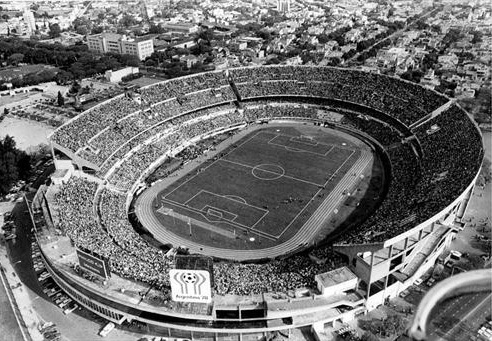 no song, but you can listen to estadio azteca, by calamaro, on the estadio azteca which was also an olympic site. ps. for more on tlatelolco, read Luis Casteneda, “Beyond Tlatelolco: Design, Media, and Politics at Mexico ′68,” in Grey Room Summer 2010, No. 40: 100–126.